RapidWeaver plugin; manage your site's meta information. Is there a better alternative to MetaMate? Is MetaMate really the best app in HTML category? Will MetaMate work good on macOS 10.13.4? 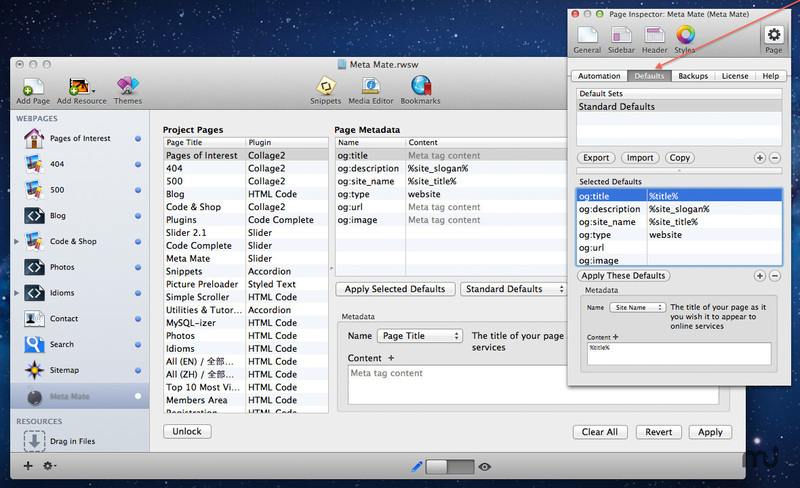 MetaMate is a meta information management plugin for RapidWeaver, powerful desktop publishing software for Mac. Manage your project’s meta in one convenient place with Meta Mate. Mould and perfect your meta information as carefully and thoroughly as you would for your site’s design. With Open Graph meta tag names built in, Meta Mate makes it easier than ever before to ensure your sites are shareable, identifiable and integrated with the social web! Version 1.0.15: Release notes were unavailable when this listing was updated. MetaMate needs a review. Be the first to review this app and get the discussion started! Open Graph is a single technology that allows one to provide enough information to richly represent any web page within the social graph. To learn more, visit opg.me.